My friend Mr. B.K.Singhal introduced me to "Shabd Sahityik Sanstha". This organisation regularly conducts Hindi poets meet (KAVI SAMELAN). Many times, we have small gathering, where all of us presents our poems. "Shabd.." has nurtured and encouraged many budding talent in Hindi poem field at Banglore. I attended one such event by "Shabd.." and Dheer weekly on 6th June. 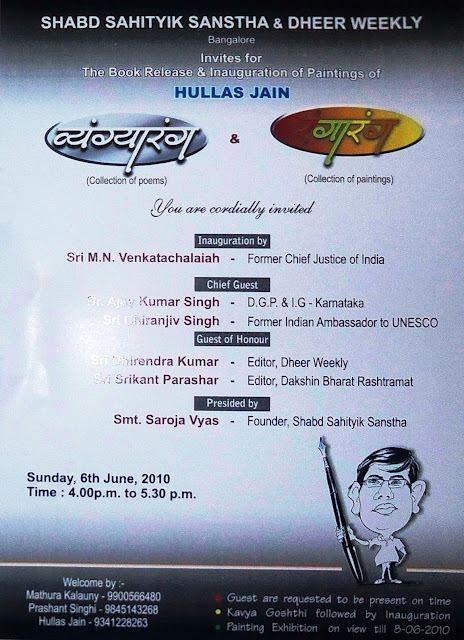 Mr. Hullas Jain released his book "Vyangyaarang" and exhibited his painting "Rangarang". You can find all the details below. Hullas has expressed very well his thoughts in his new book of poems "Vyangyaarang". It was offered as complementary gift to the audience. We had some formalities for welcoming guest and some formal speeches. The speakers appreciated his writings. Stay tune to this blog, for more such events reports. And yes, let's all wish Hullas Jain "All the best" for his future progress in art field and "Congratulation" for this event. 5th June is the World Enviornment Day. Tata Chemicals Limited used to organize different contests, at my native place Mithapur. Once I won prize in speech competition. We brought and planted Karena at our home….This year, my employer Aricent, celebrates World Environment day, by Free car checkup, sale of energy saving lights, solar cooker etc. On this day, I request all the readers of this blog to become aware about our responsibility to our planet – the mother earth. Let’s cultivate environment friendly practices in our day to day life. I have added this line to my e-mail signature. “Print Less. Go Green”.